I've recently gotten into the habit of cooking up a big batch of food on a Sunday evening, to have for lunch at work throughout the week. The idea of this was to save money, and eat a little healthier. (Basically, I hate that feeling of being caught short at 1pm and thinking: "Crap! Need to get something quick before my next meeting! Terrible food court takeaway, here I come!") Previous options have included grilled lamb backstrap and chickpea'd couscous, and lean pork Frikadellen with zucchini noodles, roast broccoli and sweet potato mash. 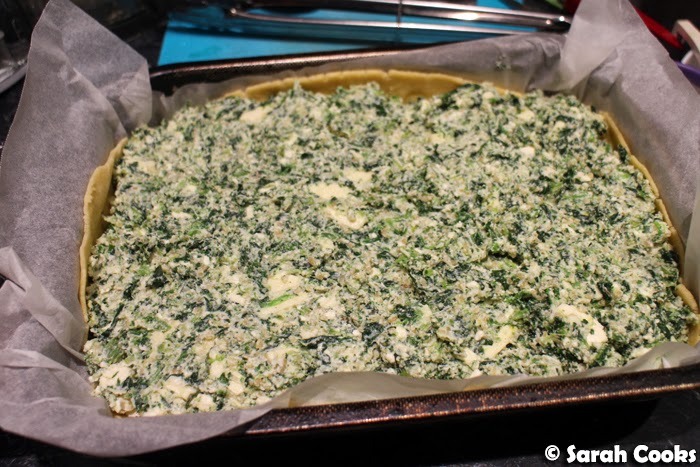 This week's effort was this glorious slab of a pie - spinach, kale, ricotta, feta and haloumi, all covered in golden rich shortcrust pastry. I can't say that this is particularly health conscious (three cheeses, white flour and a generous amount of butter in the pastry), but it certainly is satisfying. And delicious! (And, it doesn't give me that feeling of self-loathing that I get when I inhale a lemon chicken and fried rice from the food court, heh). It took quite a bit of time to make, and I won't pretend it's a quick endeavour, but I love baking and was happy to spend a few hours pottering around the kitchen on a chilly weekend afternoon. 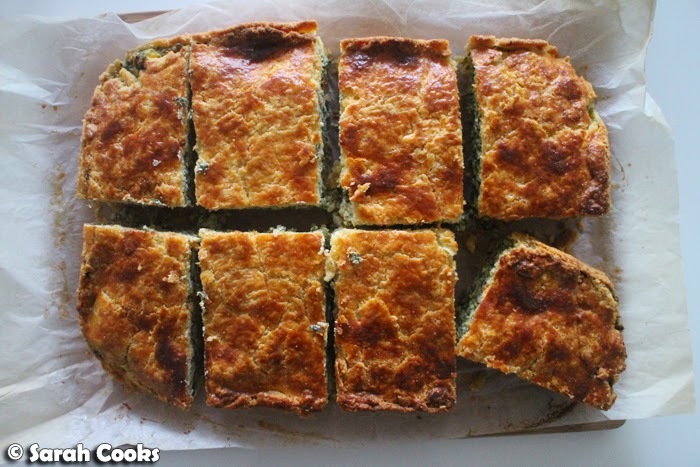 This is basically a variation on one of my favourite recipes, Nigella's ricotta, spinach and bulgur wheat pie, from How to be a Domestic Goddess. (I say "variation"; I mean "expansion"). 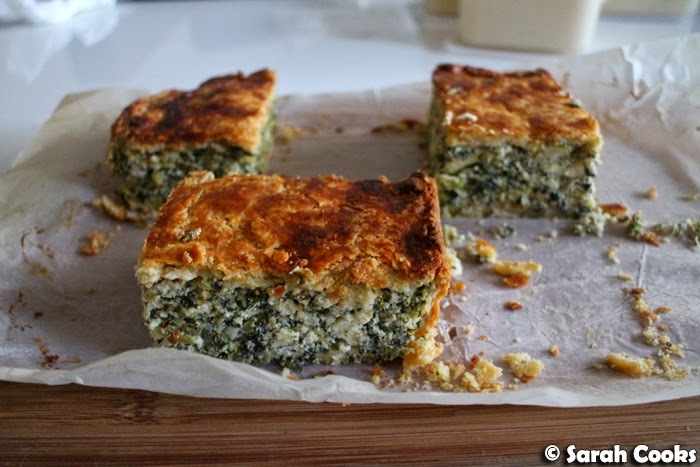 I kept most filling ingredients the same, but added extra haloumi and feta for extra salty deliciousness and texture, and increased the quantity of pastry. (Story of my life). I also replaced some of the spinach with kale, because I saw frozen kale at in the freezer at the supermarket and wanted to try it out. (It worked! Yay!) 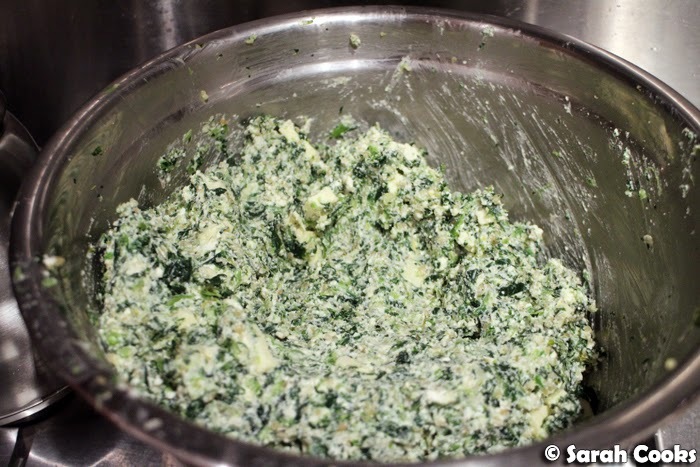 Up to you if you want to go all spinach, all kale, or a mixture of both. The filling is easiest mixed together with your hands. Food gloves make this much less messy! Here's the pastry! 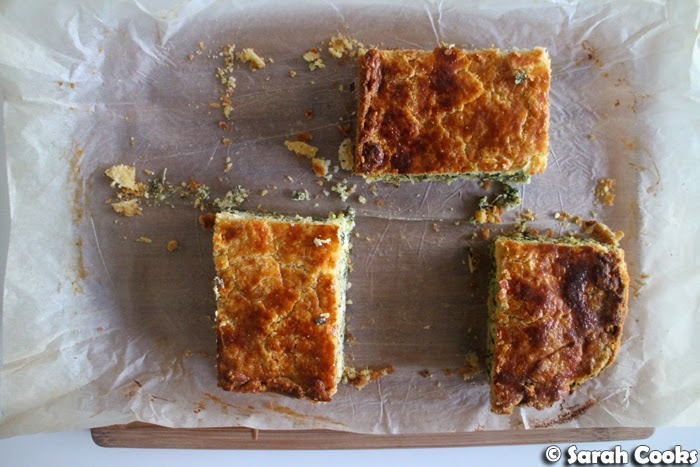 It's extra golden due to addition of egg yolks, which also makes the pastry extra rich tasting. I used a 20 x 30 centimetre roasting tin with deep sides to make my behemoth slab pie. You can see I lined the tray with baking paper - this isn't strictly necessary, but it does make it easier to remove the whole pie after baking. Also, I usually roll out pastry between two sheets of baking paper anyway, as this makes it easy to move the rolled-out pastry and keeps my bench clean, so it made sense to use the same baking paper to line the tray as well. No point being wasteful! The sprinkling of breadcrumbs on the pastry helps to soak up any excess liquid from the filling. You can see that my pie-lid was a little messy, but it all looked fine once it was baked. This pie is super sturdy, and is good warm or at room temperature. I think it would be good picnic food, if you're into that sort of thing. Given our cold weather, I haven't got any picnics in sight, and I'm just eating the pie for work lunches. Hot tip: microwave a slice to heat it through, then toast it in a sandwich press to re-crisp the pastry. BOOM. Place the flour and butter into a dish, and place in the freezer for 10 minutes. Meanwhile, whisk together the egg yolks, water and salt, and put this into the fridge. Once the 10 minutes is up, place the cold flour and butter into the bowl of a food processor, add the sugar, and whizz until the mixture resembles damp sand. (Streaks of butter are fine - desirable, even). With the processor running, add the liquid, until the mixture just comes together. (You may not need all the liquid, or you may need to add a tablespoon or so extra of cold water). Tip the dough out onto a floured surface, and press it together with your hands. Divide the dough into two pieces, one smaller than the other, wrap in clingfilm and chill for at least 30 minutes, or overnight. Place the bulgur and stock powder in a bowl. Pour boiling water over to cover. Place a plate over the bowl and set aside for 15 minutes. Drain well, pressing out excess moisture. 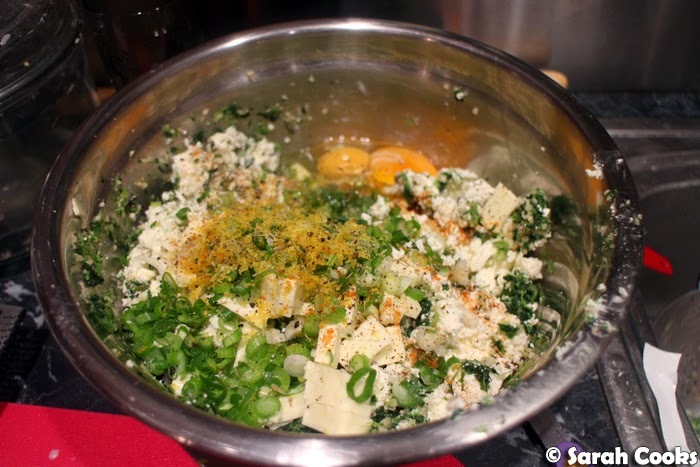 Place the bulgur, spinach or kale, ricotta, feta, haloumi, spring onions, eggs, cayenne pepper, dried thyme and lemon zest in a bowl. Season generously with salt and pepper, and mix well to combine. Roll out the larger piece of dough to approximately 5 millimetres thick. Line a 20 x 30 cm roasting tray with deep sides with the pastry. 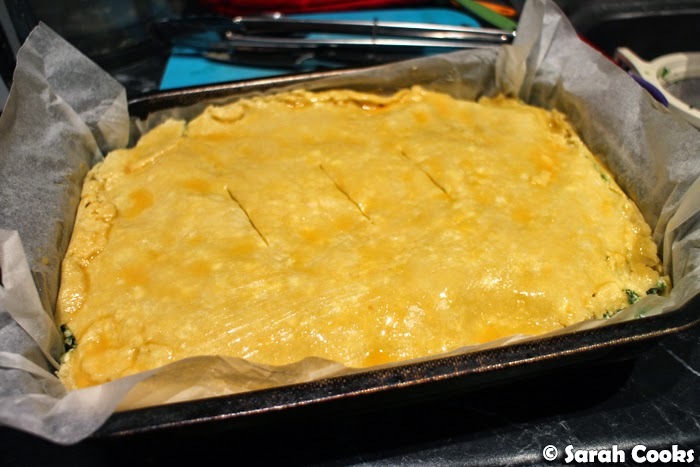 (If you like, line the tray with baking paper first - this will make the whole pie easier to remove later). 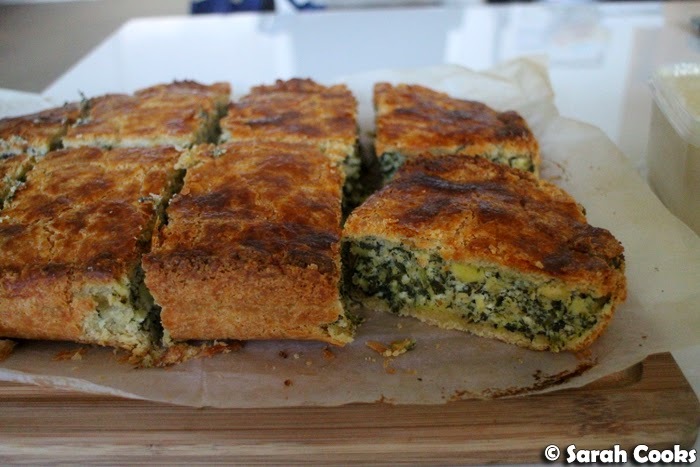 Sprinkle the pastry with the breadcrumbs, then tip in the cheesy kale and spinach filing inside, spreading gently with a spatula. 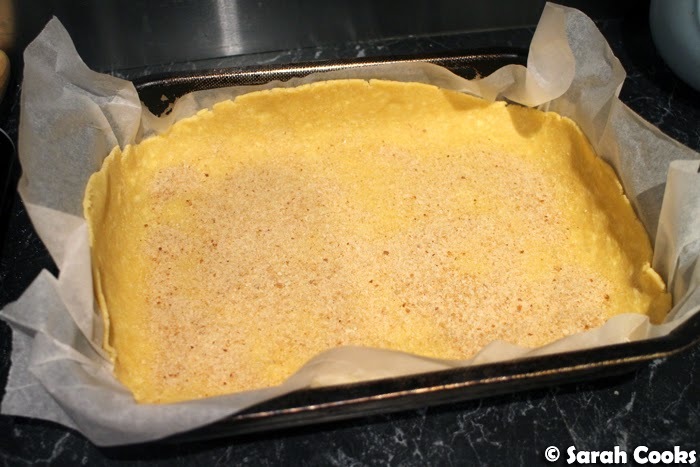 Roll out the remaining pastry and place on top of the filling. Crimp the edges with a fork to seal. Brush with beaten egg, then slice three steam vents in the top of the pie. Bake for 10 minutes, then turn the oven down to 180˚C and cook for a further 45 minutes. Allow to cool for at least 20 minutes before cutting into generous slices to serve. I don't intend to go out for picnic but I intend to make these!